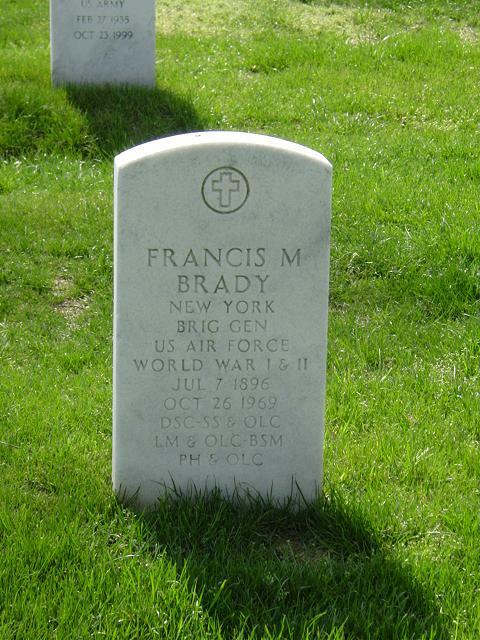 General Francis M. Brady was born in Yonkers, New York, on July 7, 1896. During the World War he accepted a commission in the Infantry Reserve as a Second Lieutenant on August 15, 1917, going on active duty on that date. He was commissioned in the regular Army as a second lieutenant of Infantry on October 26, 1917. Prior to his commission, General Brady attended Officers Training Camp at Plattsburg Barracks, New York. He was assigned to the 30th Infantry at Syracuse, New York, on Aug. 15, 1917, and to the 9th Machine Gun Battalion at Camp Greene, North Carolina, on November 27, 1917. He sailed for France with the American Expeditionary Forces on February 17, 1918, then proceeded to the Second Corps School Area until April 21, 1918, when he rejoined the 9th Machine Gun Battalion. He took part in the Aisne-Champagne, the Aisne-Marne Defensive, the Aisne-Marne Offensive, the Vesle River Operation at Fismes, the St. Mihiel Offensive and the Meuse-Argonne Offensive. For outstanding heroism he was awarded the Distinguished Service Cross, the Silver Star, the Purple Heart and the French Croix de Guerre. General Brady joined the headquarters of Base No. 2 in France between December 8, 1918, and January 21, 1919, then returned to the 9th Machine Gun Battalion. Prior to his return to the United States, he served in headquarters of the 3rd Field Artillery Brigade between May 21 and August 1, 1919, returning to the United States on the latter date. General Brady next served at Camp Pike, Arkansas, on Military Intelligence and Motor Transport assignment with the 3rd Division. He was in the Recruiting Office at New Orleans, Louisiana, between February 20, 1920, and April 1, 1920, then returned to Camp Pike, Arkansas, with the 9th Machine Gun Battalion. On August 9, 1920, he was detailed in the Air Service and assigned to March Field, California, for flying instruction. Following graduation from flying school, he was transferred to Post Field, Fort Sill, Oklahoma, in April 1921, and graduated from the Air Service Observation School at Post Field on June 30, 1921. He remained at the Field Artillery School, Fort Sill, Oklahoma, between September and December 1921, during which he was transferred to the Air Service. He went to Michel Field, New York, as Post Adjutant and Commanding Officer of an air park, successively, until October 1922, when he enrolled in the Air Corps Tactical School, Langley Field, Virginia, from which he graduated in June 1923. General Brady then assumed command of an observation squadron at Mitchel Field. In June 1924 he went to France where he was attached to French flying forces at Coetquidan, Tours, Paris and Versailles for one year. On July 1, 1925, he was appointed Assistant Military Attaché at Paris, returning to the United States in August 1925 to become Instructor at the Air Corps Tactical School, Langley Field, Virginia. The General was in command of the 99th Observation Squadron at Mitchel Field, New York, between August 1928 and June 1929, then went to Fort Leavenworth, Kansas, to enroll in the Command and General Staff School in August 1929, graduating from the two-year course in June 1931. He was next assigned as Assistant Military Attaché and Assistant Military Attaché for Air in Rome, Italy. He returned in August 1935 to enroll in the Army War College, Washington, D.C, from which he graduated in June 1936. He joined the staff of the 2nd Wing, Langley Field, Va., as Operations Officer and became Operations Officer for General Headquarters Air Force at that field in September 1938. The following April he went to Albrook Field, Panama Canal Zone, as Executive Officer of the 19th Wing. He was assigned as acting Chief of Staff of the Caribbean Air Force at Albrook Field on December 6, 1940. "He led his platoon over 300 meters of open ground attacking and capturing five enemy machine guns, with their officers and crews, thereby saving many lives and establishing liaison with the troops on his right. He recrossed the open ground to report his location. Despite intense artillery fire, he held the captured position for 48 hours, and with a leader personally silenced the enemy machine guns which were enfilading the troops advancing to his support." For extraordinary gallantry General Brady was awarded the Silver Star. General Brady was wounded while serving with the 9th Machine Gun Battalion on October 19, 1918, and for bravery coupled with the wound he was awarded the Purple Heart. For Valor he was awarded the Croix de Guerre with Silver Star.